Award Winning Journalist and Author of Subversion Inc. 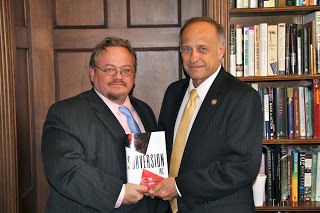 I met with Congressman Steve King (R-Iowa) on June 21 to present him with a copy of my book, Subversion Inc.: How Obama ACORN Red Shirts are Still Terrorizing and Ripping Off American Taxpayers, which he endorsed. America needs to know that ACORN is restructuring in time to help re-elect President Obama in 2012. Obama used to work for ACORN and represented the group in court as its lawyer. These radical leftists who use the brutal, in-your-face, Machiavellian pressure tactics of Saul Alinsky want to destroy America as we know it and will use any means to do it. Buy the book at Amazon. Visit the Subversion Inc. Facebook page. Follow me on Twitter.